Picking the right tennis racquet is the most important decision any tennis player will have to make in his or her life time – it’s that serious. With so many different options, for example; racquet head size, beam width, string patterns, weight, stiffness, swing weight, and power levels, it’s hard to pick the right one. What I’m about to tell you is a secret, a secret every tennis racquet manufacturer does not want to share with the consumers…are you ready for the big secret? The absolute best tennis racquet depends on each individual tennis player’s ability and what they want from their tennis game. There you have it. That’s the big secret, I know it’s shocking. Alright, let’s put all the kidding aside and let’s talk more about the best tennis rackets of 2011. First and foremost, what determines the best racquet? Are we talking sales? Performance? Win-ability? If you were to ask a tennis retailer about which is the best current tennis racquet, I’m pretty sure they would say either Wilson or Head racquets. Why? Well simply because they probably sell more of those brands than any other. So the more of a brand they sell, the more likely they will promote it – since it’s practically a sure bet. Which are the best selling tennis racquets in 2011? Like I mention above, it’s probably between Wilson and Head; of course I would also put Babolat in there as a serious contender. These are probably selling the most because the top players use one of them, for example, Roger Federer’s racquet of choice Wilson BLX Six.One Tour, Rafael Nadal’s Babolat AeroPro Drive GT, and Novak Djokovic’s Head YouTek IG Speed tennis racquet. Essentially, people want to play with the equipment the pros are using (same goes with Golf, Basketball, etc.). If we were to talk about best power tennis racquets of 2011, that would be almost impossible to accurately suggest. Impossible because each tennis player plays tennis differently than the next, some may not have the ability to generate their own power so they would need the tennis racquet to do with work for them, or vice versa. Do you see what I’m getting at? But if I had to pick a few of the most powerful tennis racquets of 2011, I would pick either the Babolat PureDrive GT, Head YouTek Prestige MidPlus, Wilson BLX Six.One 95, or Volkl Power Bridge 10 MP. That’s my personal opinion, so please take that with a grain of salt, the two mentioned tennis racquets could be completely wrong for you. Of course there’s also the desire to have control oriented tennis racquet or a spin friendly tennis racket. There are tons of variables for a player seeking either of those options. I generally tell new players who are seeking a new racquet that and open string pattern tennis racquet (16×19) will give them more spin, but won’t give them the best control. If a player is seeking more control, I will tell them to look into trying out a dense string pattern stick (18×20) which will give them the ball control they want but will sacrifice ball spin. There’s always a trade off – sad but true. I agree with the ladies….what are the best rackets for women? Are the rackets you mentioned good for women? What about racquets for women? What are some of the better tennis racquets for women who play a medium paced game? I’m a 3.5 NTRP player. Hi Rita, you’re absolutely right! I will write up a post for the best tennis racquets for the ladies! 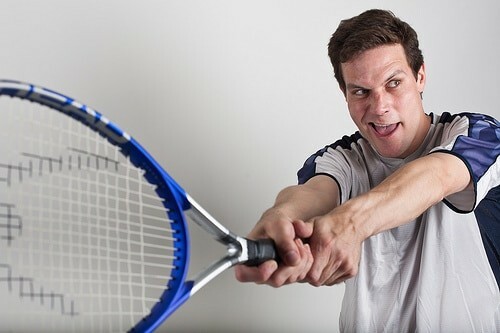 You’re absolutely right about what the best tennis racket is! There is no real way of telling somebody what the best racuqet is for their game without them trying. Great post! My favorite rackets are from Prince, the new EXO3 models are awesome!